to dchad @ cuke . com. [remove the spaces] They will be posted here. Thank you very much for your kind message of condolence . The funeral has been done by many people solemnly without hindrance. Mitsu was very proud of the relationship with everyone. She talked before “I’m happy because I can see my husband again in Nirvana”. 1-21-16 - Linda Ruth Cutts reports on Mitsu Suzuki's funeral with photos. Dear David - A couple of people asked me whether you might be interested in creating a part of your site where people could send stories about Okusan... I told them I would ask you. Shungo Suzuki told Robby Pellett that last night she had been breathing slowly, with longer and longer spaces in between. It was peaceful. -------------Cover calligraphy and poem, contents page, and introductory page on her. -----------Stories from Suzuki Sensei's Students - p.28 [Shunpo Blanch Hartman, Shuun Lou Hartman, Rosy Penhallow, Yvonne Rand, Michael Wenger, Marilyn McCann Coyote, Fu Nancy Schroeder, Darlene Cohen, Hekizan Tom Giradot, Edward Brown, Gregory Wood, Laurie Schley Senauke. “One memory which I think about often is how she responded when asked about the ‘secret of her long life’. She said there are three things: Walk every day, do not hate anyone, and have good conversations! I face west in gassho, beyond the mainland and the Pacific to those gathered about Mitsu Suzuki. She was exemplary as a model of how a temple wife supports the head of the family and all the temple members. I have seen other models in Japan, in wonderment. I met her but on few occasions. There is the saying, "See one and know ten". She was solid. Would that all of our Zen temples and Zen Centers have such a spouse, such a partner. "Zen is Right Here" is a small book of SFZC students' anecdotes about Suzuki Roshi. Can one come about to likewise honor Mitsu Suzuki? How can there not be many stories? Her examples are also teachings. Especially to all in the Branching Streams, and those lucky to have practiced with her, my deep condolences. She was a true Matriarch of American Zen. When I was a young student at SFZC in the late 70s, and living in the CIty Center building in the early 80s, Okusan was a constant steady, quiet presence in the background of our practice. I had the privilege of taking tea classes with her briefly, before my injured knee forced me to stop. She was very careful and strict about details of chado performance, but always wholehearted and kind. I have been doing practices for Okusan. How do I get to the piece you said I wrote about Okusan.? I think of her often and have been doing some practices for her safe and kind passing over. She was always kind and dear to me. Thank you very much for writing to us about our beloved Mitsu Suzuki’s passing. We send our deep condolences to you and Hoitsu Suzuki-roshi and all of the family for this loss—our heart is with you. How grateful we feel to know that her dying was peaceful. Today at City Center, Green Gulch and Tassajara we are ringing the temple bells for her 108 times and are holding memorial services. Please keep us informed about the memorial service that will be scheduled in Japan for Mitsu Suzuki. I want to express my deep condolences for the passing of the beloved Suzuki Mitsu sensei. Her tender and wise teachings will always resonate in my heart. I am happy to tell that the Hebrew translation of Temple Dusk has made the name Suzuki Mitsu a known one in the Israeli circles of poetry, Haiku, and Japanese culture in general. Her graceful art lives now also in the heart of many Israelis. I imagine these days are not easy for anyone who knew her, and I bow deeply in her memory. I did not live at City Center, so did not see the Suzuki’s often. In the 1960’s, Roshi was a regular once-a-week guest speaker at Haiku Zendo in Los Altos, where my family and I were living and practicing. After being around Roshi and listening to him for about four years, I decided I wanted to be ordained. That’s the way I remember her: quiet, focused, no nonsense, supportive of her husband and his students whenever needed. Re memories — mostly as just a kind, loving, heartful present, wise woman who loved, understood her husband and at times didn’t take him too seriously. Here is my offering with a photo of us on the steps of CC on the way out to something. Early in 1991 I was offered the opportunity to be Okusan's designated driver. I knew her only by sight but I agreed. At first I mainly took her grocery shopping on Friday mornings and we gradually got to know each other. She began to ask me to take her to some of her many social activities in the Japanese community and sometimes I was included, sometimes not. She often invited me into her apartment for tea and conversation and occasionally a meal, like one memorable Christmas eve during which she sang me famous Italian opera arias in Japanese! I gradually came to realize that she always was polite and kind to me and to believe that she consistently took my viewpoint into consideration before she asked me to do something. The result was astonishing. Finding one of those notes on my door ["John-san, I want you"] my heart would leap up and the response was automatically YES. I would immediately go to her knowing that I already wanted to do whatever she wanted whenever she wanted. Often, meeting her in the hallway, I would experience the most amazing expansion, smiling and bowing and magically feeling absolutely terrific. I totally loved the moment every month at the end of the Suzuki Roshi memorial service at City Center when she would turn to us assembled on the stairs, bow and murmur "Thank you." We had many interesting conversations, sometimes hilarious in our struggle to make ourselves understood. No topic was off limits. Once she found me at her door, tearfully morose with self-pity over the demise of a long-term relationship. She invited me in, turned off the Japanese soaps on TV, gave me tea and started talking with the aid of her dictionary. She told me, among other things, that I absolutely must not develop hate or resentment toward the other person. She said never to forget that I chose him from among all the others and that had not changed. He was the same person. As her long anticipated departure drew near she told me that she wanted to be back in Japan for her 80th birthday. She also told me that she wanted her daughter to have the gift of taking care of her mother in old age (!). She also confessed that she was tired of making the mighty effort of speaking English. Toward the end she told me she wanted to take a ride crossing all 5 bridges of San Francisco Bay in one day. Her schedule was hectic with social activities in Japantown and we never found the time to take this trip. I was moved to see the pictures of Okusan in recent years, the devastating ravages of time on someone I loved. At first I refused even to believe that the last photo taken by Shunko last October was actually Okusan. I had to look at it a long time to see her there. The same person. 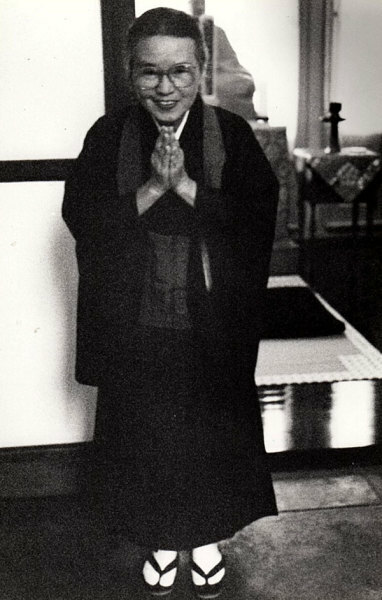 Today I am inclined to say that Okusan was the most significant relationship I had in my 25 years of Zen practice. 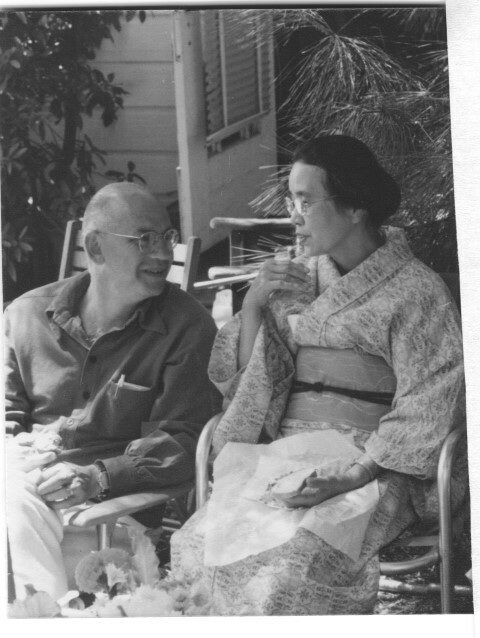 photo of Mel Weisman with Mitsu Suzuki at 1980 wedding of Mary Watson and Jack Weller. 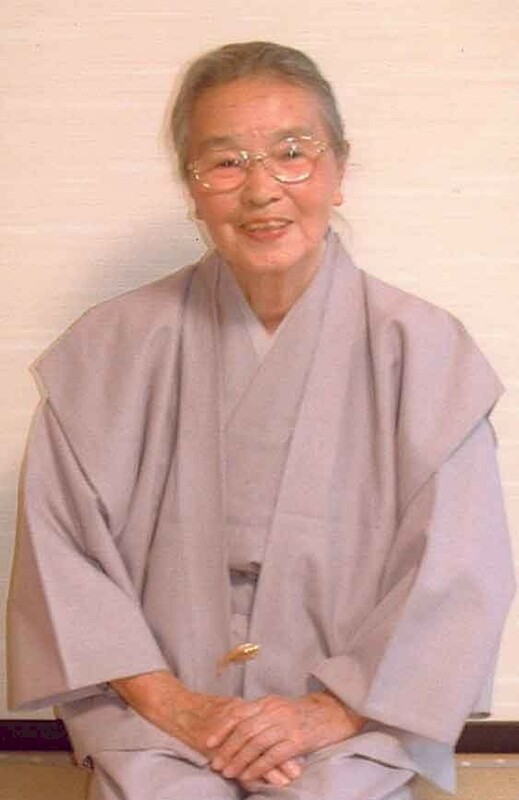 My first encounter with Ms. Suzuki (Okusan) and with Zen Center was when a friend wanted to show me Tassajara and we arrived in the middle of Suzuki Roshi’s memorial service at his ashes site. There was a small Japanese woman who was crying and crying. Little did I know then, how important she was to become to me. When I began to study Japanese tea ceremony with Okusan in 1977, I didn’t realize that she hadn’t been a tea teacher for so long. She was learning how to do that as we were learning this terribly complex form of mindfulness called Chanoyu- in the Omotesenki way (that being one of the schools of tea ceremony). I remember her saying, “You Americans do everything backwards.” We turned the bowl the wrong way, squeezed out the cleaning cloth the wrong way and we just had trouble with basics like sitting seiza on our knees. I forgot a pencil to take notes for my second lesson. Whatever she said, I never did that again. Okusan took extensive notes and I still have mine from the 1970’s and use them- as I have continued with this amazing ceremonial form. However, for a time at Zen Center, it was not felt right to take notes, but just to remember everything spontaneously. I had a feeling that if I thought of something else (than what I was doing), Okusan would know and clear her throat and I’d come back to say, entering a tea room. She would not let us get away with any wrong moves. There were certain times the head-master of the Omote senki school would come to San Francisco. We would be selected to perform for him. At one such event, just as I was about to enter to make the tea, Okusan was adjusting my hair. I went on to drop the water ladle onto the tatami as I was walking in. I had to go back, wash it. I’ve rarely been so embarrassed. This sort of mistake reflects on your teacher. However, as we were “backward” Americans, it might have been a bit more forgivable. Okusan came to my marriage with Jack Weller, a student of Suzuki Roshi. I made memorial tea with Okusan after my father died. I was studying with her when I was pregnant- not due for 6 weeks- and felt “gas pains” which was our son, Daniel, deciding to come out early on that day. She loved babies and children, including our Daniel and would hug and cuddle them. She came to the children’s tea we then had every month and introduced the children to making an offering of the sound of the bell. Our tea group would go out to dinners in Japantown after a special tea gathering. After a bit of saki, I remember Okusan starting to sing songs that she used to teach her kindergarten class. We would try to join in. She loved to sing. She loved people and loved telling stories. It was an honor to be invited to have tea in her small kitchen. 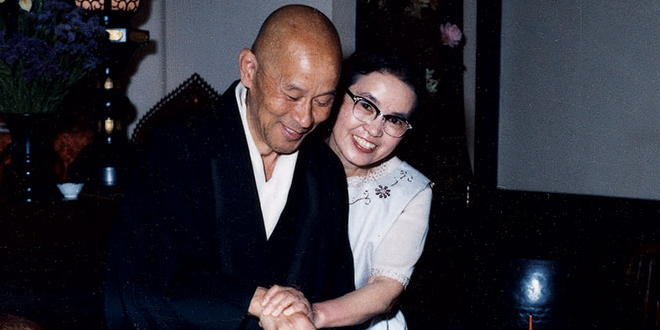 She knew everything that went on at Zen Center and was a mother to us all. Especially, she had opinions about the right behavior of priest’s wives and priests - which differed a bit from the prevailing San Francisco culture of the 1970’s and 80’s. I remember that Okusan had certain days for certain events. Tuesday was tea teaching day, another was for going to Japantown, for cleaning, etc. Every so often I would be honored to drive her to an appointment and remember doing a special car cleaning first. After Okusan had an operation, I remember her walking up and down the Zen Center hallways and on the roof. She loved to walk also in Shizuoka where she lived with her daughter. When Jack and I visited and she was in her 90’s, she took us on a walk past an elementary school and many neighbors with whom she had become friends. We went down to the sea and back along a river - not a short walk. I am honored to have studied tea with Suzuki Sensei for the 16 years I did. She was such an inspiration and a vital spark for so many people. May we carry her spirit with us. Shortly after Temple Dusk was published, Suzuki-sensei had me into her apartment for tea. This was a more informal Sencha tea served at her kitchen table after Tea Ceremony instruction. This second tea was a chance for greater warmth, as if to repair from the rigorous correction of me during the Ceremony instruction. The expansive meditative feeling of the Ceremony then carried over into a more casual depth and intimacy that I have ever since associated with the way Tea should be served. “Ah.” Suzuki-sensei said turning and quickly left the room. While I was left with the question of what it all meant, it was not uncomfortable. There was always so much out of sight of unknown Japanese culture, and unseen in reference to her wisdom that I just stayed with my tea. It wasn’t clear what her question was about, or even if there was any more to it. So many of the assumptions in Tea Ceremony and Japanese culture were only to be known later in some unexpected revelation, that I had learned to appreciate feeling upended as a kind of savory freedom. After a while, she came back into the room. With her, she had the poem on a scroll written in her own hand. It was rendered with a light fluid touch, like mist and raindrops moving over very tiny flowers. When she gave it to me she said, “When you chose this poem I thought, this is exactly you”. She always gave new meaning to the word gratitude. Yesterday, January 10th, 2016, Saturday, I started packing for my move at the end of the month. I came across some old Wind Bells. Inside one was a card from Okusan. (As noted below, Okusan is how everyone addressed Mrs. Suzuki except her tea students who called her "Suzuki Sensei".) I was so glad to read her note and well wishes and that she included the photo of her happily holding the ballon (1984). I put my boxes down. I gazed at her smiling face. I closed my eyes. I could hear her voice clearly. Okusan was telling me to sit at her kitchen table, "Barbara san, please make yourself comfortable," while she bustled around preparing us a cup of tea. I remember being grateful I was NOT her tea student because I never would have been able to relax and just enjoy the tea! One of my strongest memories of San Francisco Zen Center is watching the big football player type students in their formal garb trembling in the hallway outside Okusan's door while waiting to be summoned inside for tea ceremony instruction. Okusan's height and slight frame were the only small things about her. She was held in the highest esteem as a beloved, no-nonsense tea ceremony teacher; she expected nothing less than total dedication from her students. Every so often her friend and fellow tea teacher Nakamura Sensei, who may have been even smaller than Okusan, would visit from Japan. Together they would hold larger tea classes and events. Those two tiny Japanese women wielded a level of influence and power that is legendary among those who had the privilege to know them. The memories warmed my heart. I wondered if Okusan was still alive. I reassured myself that the Sangha would send word of her passing. I sent thoughts of gratitude her way. I thanked her for staying on at Zen Center so long after Suzuki Roshi's death, when she could have understandably returned to her family. I sent my appreciation for her great patience with the clumsy Americans! I smiled, put the photo back in the card and the card back in the Wind Bell. Before Jaku and I went to Tassajara around 1987, we lived at City Center in two rooms at the end of the "holy hallway." This is the second floor of City Center where Mrs. Suzuki lived and the abbot's have their dokusan room. Everyday Okusan would walk briskly up and down the hallway. At the end of the hall in front of the glass doors leading to the fire escape were a couple of sickly potted plants. They were right outside our doors, but we had been ignoring them. One day Okusan said to Jaku, "You must take care of these plants, they are your responsibility." Of course after that we did. It was a good lesson in understanding that when there is a need it is our practice is to respond. As John Grimes mentioned, Okusan would attend Suzuki Roshi's monthly memorial service in the kaisando at City Center. The stairs in front of the kaisando would be filled with students both going down to the first floor and up to the third floor. Our voices would resonate throughout the building as we chanted the Dai Hi Shin Dharani. When service was over she would come out and stand next to the door and gassho, thanking us. It felt very gracious and also somehow embodied the heart of the temple. Now there is a picture of her making gassho on the wall next to the door where she would stand. These days when I visit City Center and go past the kaisando and bow, it is as if all of us are still there standing and bowing together. from Beverly Morris (Horowitz) Armstrong. When my heart remembers her, I can see her in the courtyard where she often went after she washed her hair, toweling and tossing it around to air and dry, dancing, singing, and talking to the finches and plants. She was alone then but I could see her from your window and felt privileged to be a fly on the wall. Alan Marlowe worked in the courtyard garden, with a lot of input from Okusan. He was so tall, she had to bend backwards and look up to talk to him and she laughed about that. Okusan started my first nuka barrel and taught me how to make pickles. When we moved into the Page Street building, her kitchen continued to be a “secret” route to Roshi. She was always happy for anyone to come in, when we knocked or rang the little bell. If Roshi was there, she made tea, and if Roshi wasn’t she still often made tea. Okusan didn’t exactly approve of brown rice, would turn up her nose at our brown rice sushi but was still very available to show us the best ways to fill and roll it, how to fan the rice, how to cut and present it. She had a particular way of scrunching her nose and saying “stinkies” to things we did that weren’t the Japanese way (like how we cooked greens directly instead of first blanching to get out those stinkies). When i became Tenzo, Suzuki Roshi didn’t really want me to be in the kitchen, but Okusan came down often to help and be supportive. I am so very grateful to Okusan for bringing me to Roshi’s bedside in the weeks before he died. For the first time as a student, I started to skip service or the 2nd sitting. She would invite me in, so that we could have some last times together. Some of us sat on zabutons around his pine coffin all day and night during the week his body was there. I remember Okusan coming every day, talking animatedly with him in Japanese. I couldn’t understand the words but sometimes it seemed she was quite angry with him for dying, for leaving her. Once during that time she came upon me crying in the corridor. She grabbed me and said, “Do you want Roshi? Here, come. Roshi is here, come talk to him,” and she pulled me into their apartment and pushed me onto a zafu in front of the tea table. I think his picture was there. Her grief felt angry. We sat together. In the new building, Roshi decided we needed a Buddha Hall for chanting and bowing and ceremonies. It was a lot of work to move all that furniture from the living room to the dining room and put down the tatamis. Jim Morton made the new shrine out of unfinished pine and carved it the special way you can still see according to Roshi’s design and instructions. Roshi and everyone had gone up. We knew we were supposed to make an offering of the food at the shrine in the zendo but had no idea how to do it. So we knocked on Okusan’s kitchen door and she came down. She showed us how to fold paper for the red lacquered offering trays and how to set up a tiny piece of cake and went down with us to the zendo. We bowed and offered incense and the cake. Then I asked Okusan if there was any special chanting we should do for this occasion. She thought for a moment and then broke into a big smile. “Happy birthday to you, Happy birthday to you, Happy birthday dear Buddha, Happy birthday to you,” she sang and we joined her, the three of us in the zendo singing. We had a dinner in the dining room with sake and entertainment by whoever wanted to. Issan Dorsey got up on the table and started doing a song and dance routine. Okusan, also a bit drunk, got up on the table with him and they improvised a funny act. I wish I could remember the song. Had heard that it was Japanese temple custom for people to cook for everyone on their birthday. So every year I made something, cake or apple crisp. At the city center, I brought some up to Roshi and Okusan’s apartment. They came out, and as I gave them the pieces of cake, they both sang together the Happy Birthday song to me. Wish I had a picture of them in that moment. Have studied flower arranging, but the only and best lesson I ever needed was a spontaneous one from Okusan. We were standing in front of a niche that had an arrangement in it she didn’t like. She said, “American flower arrangement,” and then stood very stiff and frowning with her arms tight at her sides and bent at elbows, hands out and very symmetrical. Then she said, “Japanese flower arrangement,” and smiled big, lifted off one foot with her arms and whole body dancing out to one side, grace. Then she “corrected” the arrangement in front of us by lifting the whole thing up out of the water and letting it fall back however it wished to. When we visited, she told me she’d felt guilty, she’d thought I left Zen Center because she wouldn’t teach me tea (I couldn’t sit seiza). Of course that wasn’t the reason, and she was relieved when I told her. Will always cherish the tea cloth she gave me as a going away gift.